Day after day, see instant results and long-lasting cumulative benefits with continued use of Smart Profile Uplift (cleansing & firming). AFTER 1 USE: Facial fine lines are visibly reduced and moisturizer feels like it absorbs better. 1 WEEK: Skin is more radiant. 2 WEEKS: Skin looks healthier and is younger. 4 WEEKS: Pores appear smaller and skin feels smooth. 8 WEEKS: Face and neck appear lifted, toned and tightened. 12 WEEKS: Visibly improves multiple signs of aging on face, neck & décolleté. Use the Firming Massage Head, with your favorite anti-aging creams, emolliating serums, oils and even hydrating masks, to help boost the absorption of your daily skincare. Smart Profile Uplift’s 2-in-1 revitalizing sonic cleansing and firming massage visibly improves multiple signs of aging (wrinkles, firmness and radiance) for a youthful-looking face, neck and décolleté. 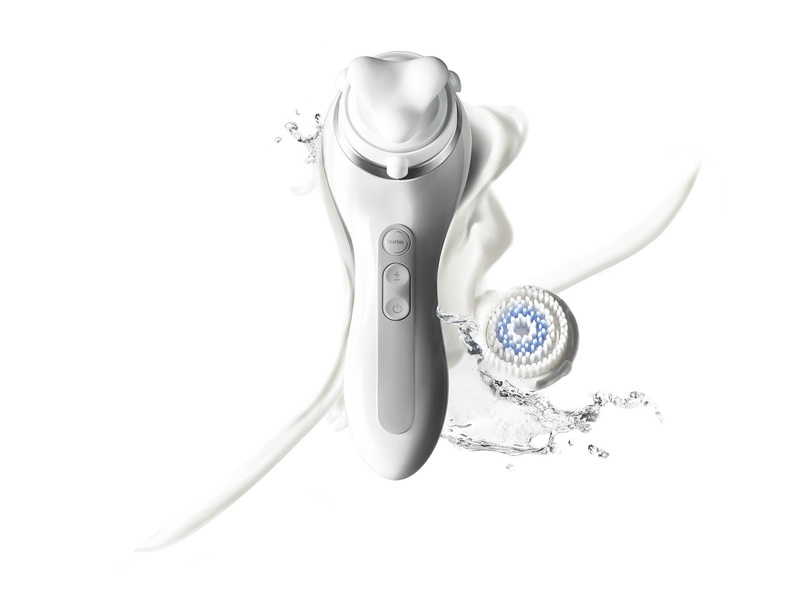 The device utilizes Clarisonic’s smart microchip technology embedded directly in the smart brush heads, which enables the device to automatically operate at the optimal cleansing or firming frequencies. Revitalizing cleansing reduces the appearance of fine dry lines and minimizes the look of pores (after 1 week) for a younger looking face, neck and décolleté. absorption of anti-aging skincare products. The Revitalizing Cleanse Brush Head is made from ultra-soft tapered filaments and is – like every Clarisonic brush head - gentle enough to use twice daily even on sensitive skin, The pre-programmed smart protocol also includes an extra 20 seconds for cleansing the neck, an area frequently forgotten in the daily skincare regimen. USE FOR 80 SECS, TWICE DAILY. FACE & NECK. Attach the Revitalizing Cleanse Brush Head. Wet face and brush head thoroughly with water, then apply cleanser of your choice to the brush head or your skin. Manual mode is set for 60 seconds of cleansing at the intensity of your choice. Follow the same stage cleansing as described above. Use with your favorite anti-aging creams, emolliating serums and oils. 27,000 micro-firming massages over 3 minutes smooth fine lines and wrinkles and boost the absorption of your daily skin care. Skin feels firmer, skin’s elasticity is improved, face and neck appear lifted and contours look more defined (based on 12 weeks use). 92% of women thought their skin felt more moisturized. Our new smart Firming Massage Head is shaped to glide effortless over contours for a pleasurable ‘spa like’ experience. Its patented design works with Clarisonic’s unique firming frequency to provide optimal results. Existing Smart Profile owners can uplift their current device too. The New Firming Massage head, which can be purchased separately, operates on all existing Smart Profile handles. USE FOR 3 MINS, TWICE DAILY ON FULL FACE, NECK & DÉCOLLETÉ. Attach the Firming Massage Head. Apply your skincare onto the face, neck and décolleté. Gently glide the firming massage head over skin in upward and outward motions, starting at the décolleté and ended on the forehead. Quick 30 second routines. Adjust protocol to target the area of most of concern for you. Achieve results in just 30 secs, twice daily on a targeted zone. PLEASE NOTE: Avoid using any quick absorbing or mattifying products to ensure the massage head can comfortably glide over the skin without pulling or tugging. The Firming Massage Head only operates with Clarisonic’s Smart Profile Devices and cannot be used with our standard cleansing devices. Designed to cleanse, massage and exfoliate the body to reveal softer, smother skin. Perfect for smoothing extra dry, dull skin on elbows and knees, prepping skin for a closer shave on legs, and before applying self-tanner. USE FOR 3 MINS, FULL BODY. Set Includes: Clarisonic Smart Profile Device, Firming Massage Head, Revitalizing Cleanse Brush Head, Turbo Massage Body Brush Head, 1 oz. Refreshing Gel Facial Cleanser, USB Charger and Wall Plug. Clarisonic Smart Profile Uplift is available for $349 at Clarisonic.com and skincare professionals. With over 45 US PATENTS in design and innovation Clarisonic technology is still the #1 most recommended skin cleansing device by US dermatologists. Clarisonic invented sonic skin cleansing in 2004 and today has sold over 15 million of its patented —and much loved—devices that help to reveal healthy, younger-looking skin. Available in over 50 countries around the world, Clarisonic delivers infinitely better skin, cleansing skin 6x better than hands alone. Gentle enough for twice-a-day use, Clarisonic devices are the #1 most recommended skin cleansing devices by US dermatologists. Clarisonic’s award-winning products are distributed through dermatologists, cosmetic surgeons, spas, prestige retailers and online at Clarisonic.com. Clarisonic is headquartered in Redmond, Washington, USA and is part of the L’Oreal Group.